It's Free Forever | VIDYA School App is a cloud-based school website development platform. 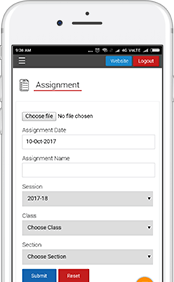 Student App fills in or alters information about anew student in accordance with session, class and section and admission date and number. With My School App, you can update and edit elementary detail about the school such as Name, Contact and Website address and so on. You can choose among free templates and decide how your school website will be outlined. All the content will be displayed fitting in the desired layout. You can enhance your visibility in search engine result page (SERP), SEO app let you decide keyword, description ,and title for a website to boost it for search engine result. Social App let you engage your website visitors towards your social media accounts. You can add your social media page link to thewebsite through it. 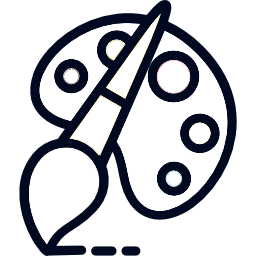 You can change the color scheme of your website layout from predefined themes. Session App lets you name a session as well as decide a start and end time. Branding App let you replace VIDYA School App subdomain to your own school domain for the more professional look and feel. Branding App uplifts your school name to a brand name. 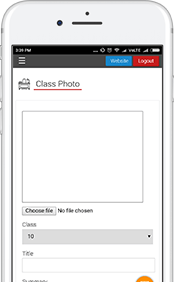 Class App let you create a class with a name that can be later used while updating student information via student app. With section App, you can create and name a section and later used it to group student into it. 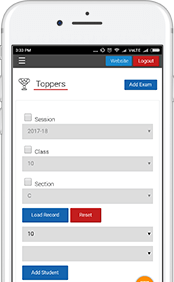 Exam app can be used to create an exam with name and define class and section for which the exam will be conducted. Notice app lets you publish anotice on theschool website. 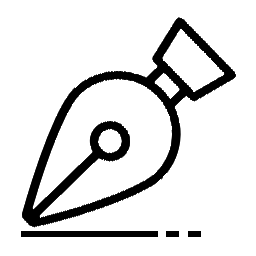 You can write notice text and set start and end date and time as well. Prospectus App makes it easy to advertise your school prospectus through theschool website. You can upload the prospectus that can be later downloaded by any visitor. 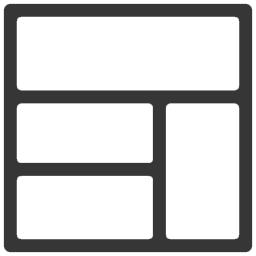 The home app lets you choose from attractive homepage template for your website. You can edit school mission message and school image for thehome page. You can upload videos of school events. You can also sort video by creating agroup for them. The app also lets you make YouTube channel right from the app. 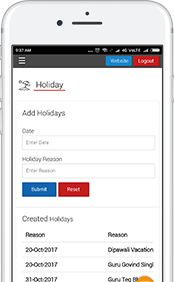 With enquiryapp, you can decide what the visitor can enquire. 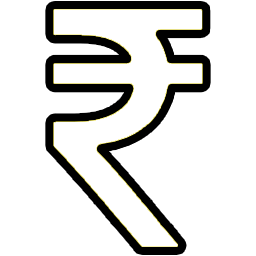 You can also configure the email account where the desired enquiry will be forwarded. Media gallery lets you organize your media interaction on the website. You can upload images and group them. You can upload the content that you want the visitor to download. Flash app lets you change flash as thebackground image of your website. You can upload flash images and can choose transition effects for the flash. About app let you put onthe view about your school. You can also pick acatchy template for about us page right there. You can update photos about school events, occasion,and activities by Photo gallery app. You can also group the photos to respective event groups. Tool app lets you add web tools like sumo me, google map and hit counter for better analysis of the website. You have to just paste the links and submit. You can convey your school key people note by message app on your website. You can add animage of aperson and choose among enticing templates for it. 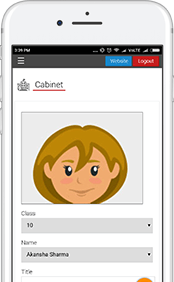 Curriculum app lets you update and edit the program of study consisting subjects, theapproach of teaching, and assessment scheme. Announcement app lets you publish amessageon the homepage for every visitor on the website. It can be a new admission notice or an intraschool competition event. Subscription app lets you compose an email and send it to visitors who have subscribed your newsletter. The co-curricular app enables you to showcase about all the co-curricular activities with images and description. Transport app lets you update all details and images about the conveyance facility of school. Infrastructure app lets you specify and describe the amenities and resources the school own. You can add images as well for better impact. It let you clarify all the regulation and policies that school recommends. You can add images and description to display all the guidelines on the school website. Testimonial app lets you add the parents and students review about school on thewebsite. These review act as areferral for the visitors to the school website. School info app lets you upload your school information according to norms of theconcerned education board. By alumni app, you can broadcast a message for former students to get together and cherish their old school days. You can write a message for areunion for old pupils. Branch app lets you show details such as name, address,and contact about all your school branches. All your Contact detail including Address, E-Mail, Contacts. Provision to receive online admission application form. 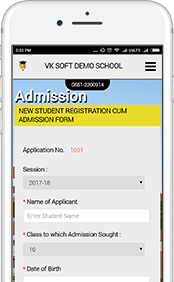 From this app you will able to see and process the online admission form at one place. Instant SMS feature integrated in Vidyaschoolapp. From website you can SMS to Students and parents instantly whenever required. 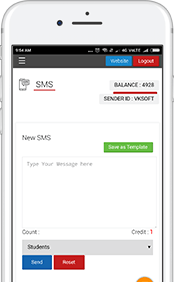 From admin you can send individual sms or save sms as template for future sending. A very unique app to feel student special and develop a strong relationship with school. 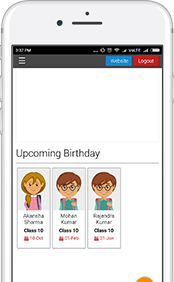 App manage all upcoming Birthday wishes and display it at your website. School cabinet is the entire parliament to make a plan and strategy for school events and other occasion. This app manages all the detail with their post in this section. It is the best feature of your vidyaschoolapp. From website you can mail to Students and parents instantly whenever required. 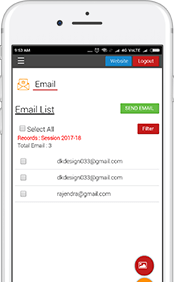 From admin you can manage all your mail and send mail to all students as well as parents with single click. This provides you to display a monthly vacation list at website. From admin panel you can add and create the holiday list, edit it or delete when it is not necessary. From this list students and parents are always aware about holiday. You can place all your class room photos with its special specification. Visitor can easily understand to see the photographs that what you are going to provide the facilities to students. This is the best section to explore schools without saying any single word. Upload all assignments for class at website. Students easily download their assignment whenever required. Assignment can upload in various formats like word, pdf, jpg, png formats with class wise and section wise respectively. Manage all the records of management team. It helps you to maintain and track all the record of management including their name, qualification, designation, department and experience and show these records at website. 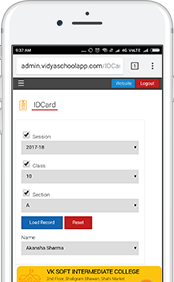 In this app there is facility to design the ID card of student. There are predefined design formats available for ID card. You have to choose one of them and set as default id card and it automatically generate all student’s ID card. Create a complete portfolio for your School Bus Drivers. 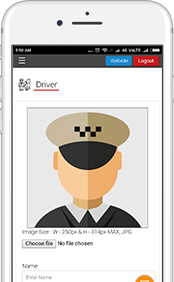 It is a very safe practice to keep track of record of each and every driver and provide it to parents. It can grow your faith upon parents & you can easily connect with them. 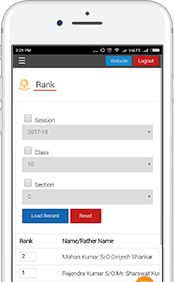 By this app you will able to show the student’s class wise ranking with some primary detail. Show three students list per class according to their ranking first, second and third. Facility to upload and display the list of Topper Students at website. It inspires other students to achieve the highest position in school to preserve their seat in this display. 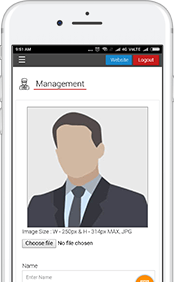 Manage all the records of all your teaching staff. 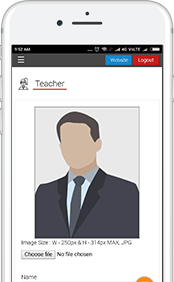 This app helps you to maintain and track all the record of teachers including their name, qualification, designation, department and experience and show these records at website.